As the winter weather starts to set in, the days grow shorter and the temperature gets lower. To keep warm, you might bundle up in your favorite sweater or settle down in front of the fire. If you’re looking for another way to keep warm, try these six delicious hot drink recipes. Whisk together the apple cider, red wine, orange juice and honey in a large saucepan. Add the cinnamon stick, orange zest, cloves, and star anise. Bring the mixture to a boil then reduce heat and simmer for 10 minutes. Strain the mixture and discard the spices. Place an orange peel in each mug and fill with the hot mulled wine. Combine the cardamom, cloves, and peppercorns in a mortar and grind into powder. Transfer the powdered spices to a medium saucepan. Add the cinnamon sticks, ginger, milk, and water. Bring the mixture to a boil then remove from heat and add the tea bags. Cover and let steep for 10 minutes then strain into mugs. Sweeten the chai tea with sugar or honey to taste. Combine the cocoa powder, sugar, and salt in a small saucepan with 2 tablespoons of the milk. Cook over medium-low heat until the sugar dissolves then whisk in the rest of the milk. Whisk the mixture until heated through the remove from heat. Add the chipotle chili powder and cinnamon then stir until thoroughly combined. Pour into a mug and top with whipped cream and a pinch of cinnamon. Bring the water to boil in a small saucepan then remove from heat. Whisk in the Frangelico then pour into a mug. Place the marshmallows on a foil-lined baking sheet and broil for about 30 seconds until just browned. Whisk the mixture until heated through the remove from heat and whisk in the malt powder. Serve the hot cocoa hot with the marshmallows on top. Combine the cider, sugar, spices and salt in a medium saucepan. Bring to a boil over medium heat then remove from heat. Whisk in the brandy then strain to remove the solids. 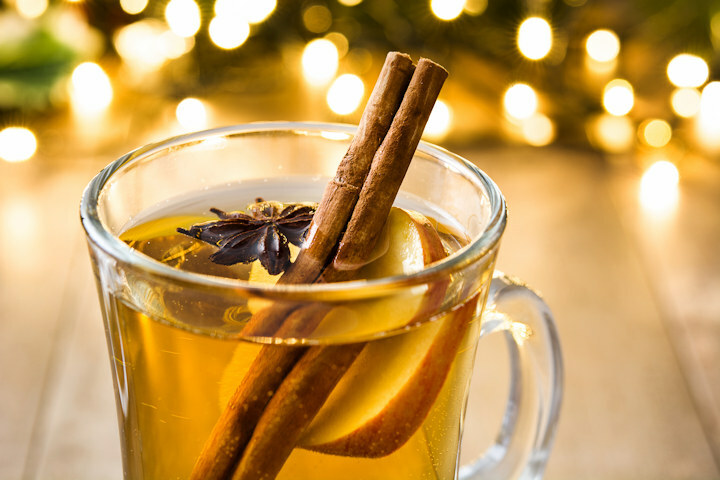 Pour the cider into mugs and garnish with cinnamon sticks to serve.